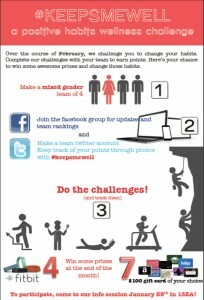 Queen’s medical students have issued a challenge to the entire UGME community to change some habits in February with the #keepsmewell positive wellness challenge. 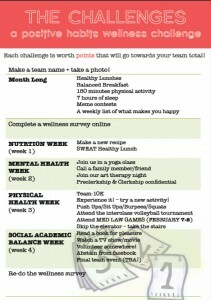 Spearheaded by the Mental Health and Wellness committee, the challenge includes month-long goals such as eat balanced breakfasts and sleep 7 hours a night as well as weekly challenges that include such things as make a new recipe, try a new activity, call a friend and skip the elevator to take the stairs. 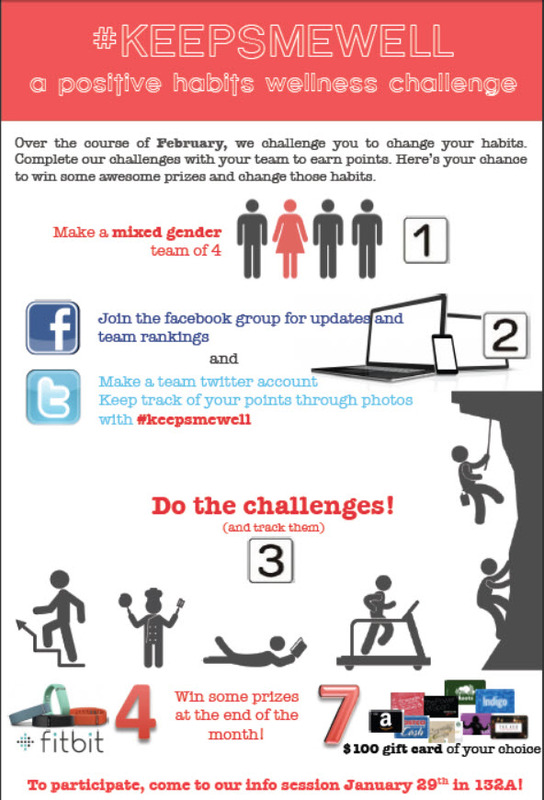 Teams need to open a Twitter account and track their activities with tweets throughout the month, including the hashtag #keepsmewell . “The goals of this challenge are to focus on changing our everyday habits into positive ones – preventative medicine!” Lip explains. In addition to Lip, the committee includes: Executive: Natasha Ovtcharenko, Shannon Chun, Rufina Kim, Meghan Bhatia, Amy Jiang, Alicia Ling, Elena Bianca, Meherzad Kutky; preclerkship members: Arian Ghassemian, Beverly Guan, David Carlone, Jonathan Krett, Madelaine Baetz-Dougan, Olivia Suppa, Sarah Edgerley, Fay Zhu, Calvin Santiago; and clerks Brandon Maser, Hollis Roth, Soniya Sharma, and Debarati Chakraborty. Positive habits (they want to focus on maintaining wellness, and developing mechanisms and habits that can build more resilience and not just address ‘when things go wrong’). For Lip, her key take-homes are that little things you do every day can make a big difference, such as sleeping and eating breakfast. “And taking time out of ‘work’ to do something unrelated, for yourself, is important” such as taking a yoga class or watching a movie. All members of the Queen’s UGME community are invited to attend the information session on January 29 at 12:30 p.m. in 132A in the Medical Building. 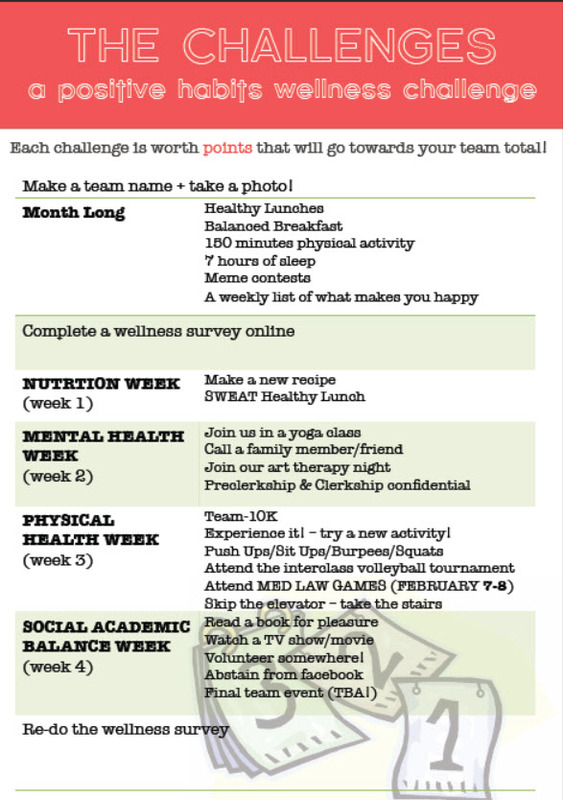 To register, email Alyssa Lip (alip@qmed.ca) by February with the names of your team of four. She’ll send a tracking sheet to get you started. One thought on "Are you up to the challenge?"